More information: 2015 is Landmarq’s 25th anniversary year. This live release is part of the celebration of their remarkable career and is a Special Edition Live CD, with a DVD of the show included, showcasing songs from the band's most successful and latest album, Entertaining Angels (hailed by Classic Rock Magazine as "the strongest of their career"). 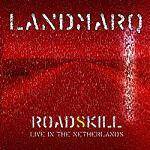 Roadskill was recorded during the band's last tour in 2013 at De Boerderij in the Netherlands, in front of a packed and enthusiastic audience. The show features the outstanding and widely celebrated vocals of Tracy Hitchings, award winning keyboard player Mike Varty, Daniel Martin on drums and the two founder members that have been there throughout the last quarter century, Uwe D’Rose (guitars) and Steve Gee (basses).